This week is flying by so fast that I almost forgot to post the Kid's Co-op. There are tons of fun & frugal kid's activities listed below. These moms never cease to amaze me with their creative play ideas and passion for parenting! I hope these posts provide inspiration for the week ahead. Do you ever find yourself looking for something on the internet and not find what you're looking for? That was how I felt while looking for easy kid's crafts and activities for Cinco de Mayo. I kept finding the same crafts over and over, but most of them were too difficult for kids or required too many materials. 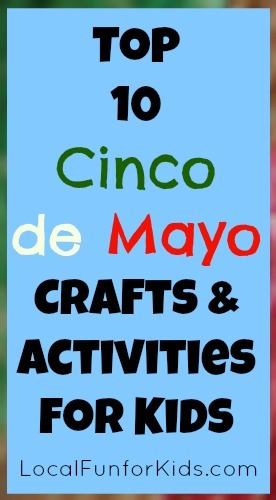 So, I did some research and searched for Cinco de Mayo crafts and activities for kids that were: fairly easy, good for a group, and didn't require too many materials. 1. Footprint Chili Pepper Cinco de Mayo Craft. 2. Easter Egg Maracas made with plastic easter eggs and spoons. 3. Pinanta Garland made with recycled toilet paper rolls. I love these!!! 4. Mexican Flag Drinking Straw - You need red, green and write staws and a print out of the Mexican flag for this craft. 5. Printable Cinco de Mayo Activities for Kids - Lots of great Mexican themed printables here. 6. Saguaro Cacti Kid's Art All you need is construction paper, rice, and some tissue paper. 7. Cinco de Mayo Mariachi Guitar Craft - These bright and colorful guitars would be ideal for 1st grade and up. 8. Chili Pepper Craft Just grab some red beads and a green pipe cleaner for this one! 9. Mexican Flag Cinco de Mayo Project - This simple craft will help teach kids about the Mexican Flag and would go great with a social studies lesson. 10. DIY Crepe Paper Flowers. You could modify this to make it easier for the age group you're working with. For instance, let the kids color coffee filters and make your own DIY fiesta flowers. Do you have any Cinco de Mayo family traditions?